Get World of Schwartz news & updates to your inbox. Social TV, Viewer Data and Monetization from Tracy Swedlow on Vimeo. Lori works with top creative and strategic executives of multiple brands, agencies and content companies to ensure understanding of new and evolving technology as well as emerging business models. Lori is a frequent speaker at major digital entertainment industry events and has been profiled as one of the “30 Executives Shaping the Evolution of Media and Technology” by Variety and “100 People to Have Lunch with” by MediaPost Publications. 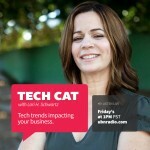 Sign Up to keep informed on the latest tech news, podcast releases and more from World of Schwartz. Copyright 2014, World of Schwartz. All Rights Reserved.